Senior Noah Wisch traveled every weekend last summer with his girlfriend to create his 351 note song on the ukulele. Car stops, trunk opens. Equipment drops, mic stand rises. Instrument case opens, record button pressed. Zoom out to Noah Wisch, senior visual and media arts major, standing on the side of the road with a ukulele. He plays a single note, and then moves to pack it all back up. “We had it down to a science at the end,” Wisch said. The project debuted on Wisch’s Youtube channel, BananaCactus Ukulele, on Monday, and has received coverage from local publications such as Boston Magazine and DigBoston. 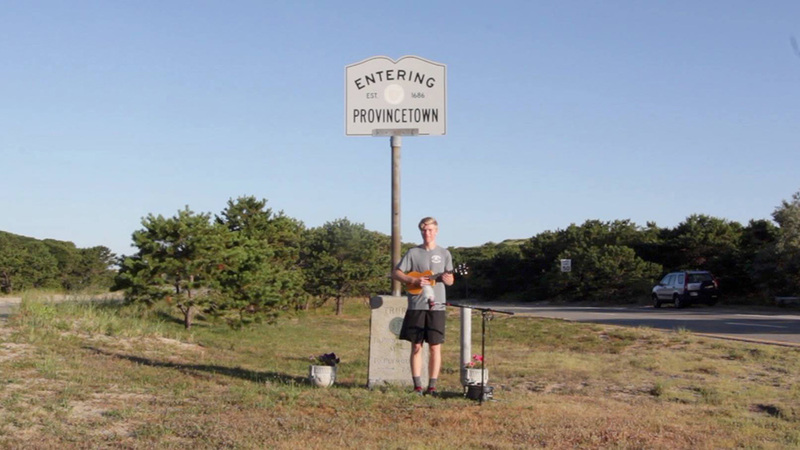 Wisch, 21, and Keenan, 22, were inspired to do the video by Massachusetts’ nearly-universal town border signs. The two grew up in Stow and Bolton, respectively—neighboring Central Massachusetts towns—and started dating their first year of high school. Now, both are continuing their schooling in the state, with Keenan at the University of Massachusetts Amherst and Wisch at Emerson, although Wisch is currently studying at Emerson Los Angeles. Wisch has been playing the ukulele since he bought the instrument on impulse three years ago, but he’d been playing guitar long before that. He mainly posts ukulele covers and instrumental medleys of existing music, like Jack Johnson and The Front Bottoms. But he wrote “Sidewalks”—named for the relief that flushed through him whenever he could stand on one at a town line—to have exactly 351 notes. Wisch put the notes and the alphabetized town names into a spreadsheet that they pulled up at each stop. “We saw parts of the state you’d never just go to,” Keenan said. They took the ferry to Gosnold, a tiny island in Buzzards Bay where people drive around in golf carts. In western Massachusetts, they pulled over at a river to go swimming. Wisch and Keenan are no stranger to being on the road together. In the summer of 2016, they took a three-week cross-country trip. They play a lot of games, listen to music, and sit in comfortable silence. This summer, they decided to hunt for the best lobster roll—they found it in Martha’s Vineyard, Keenan said. “Making A Song In Every Town In Massachusetts,” has been viewed more than 35,000 times since Monday. The graphics in the video, as well as the rest of the channel, are drawn by Wisch, who strives for a “homemade” look on his channel. Natalie Brady, a junior interdisciplinary major studying producing and marketing for film, said she appreciated the high production value. Wisch said he hopes he can combine BananaCactus Ukulele and his interest in video production professionally once he graduates this May. He said his channel helped him get his current internship with Mythical, the Los Angeles web entertainment company behind Rhett & Link.